Two days in Rome is the ideal length for an action-packed city break or romantic weekend getaway, but you’ll want to plan your trip wisely to make the most of it. Take advantage of combo tours, sightseeing passes, and skip-the-line tickets to save both time and money, or invest in a 48-hour hop-on hop-off bus pass. Here are a few ideas for two days in Rome. Morning: Maximize your time with an early-access tour of the Vatican Museums and enjoy a guided tour before the crowds arrive. Combine it with a view from the dome of St. Peter’s Basilica, a stroll around St. Peter’s Square, and a visit to the unforgettable Sistine Chapel, home to Michelangelo’s masterpiece, The Last Judgement. Afternoon: Add a fun twist to a Rome sightseeing tour and explore the city by Segway or electric bike. Zip up Capitoline Hill for a magnificent view over Rome; enjoy photo stops at the Pantheon, Piazza Venezia, and the Spanish Steps; and pause to enjoy Italian gelato. 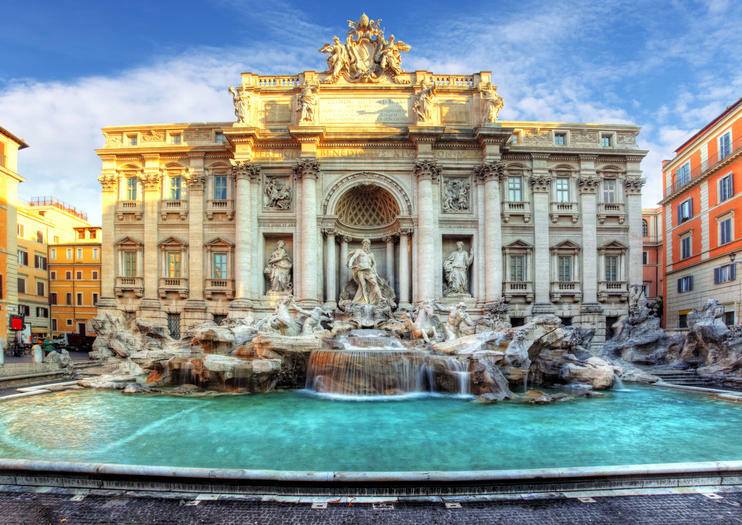 Don’t forget to throw a coin into the Trevi Fountain—it’s said to ensure that you will return to Rome one day. Night: Continue sightseeing into the evening and experience Rome’s illuminations on a romantic cruise along the Tiber river. As you sail past landmarks such as St. Angelo’s Castle, tuck into a 3-course dinner of Italian cuisine like pasta or gnocchi served on board. Morning: Make an early start and head straight for the Colosseum to follow in the footsteps of the ancient Roman gladiators and emperors. Be sure to book a skip-the-line ticket as queues can take more than two hours at peak times, or, for the best value, combine your visit with a ticket for the nearby Roman Forum. Afternoon: Now’s the time to fit in any sights that you’ve missed, so tailor your afternoon to suit your preferences. Art lovers might want to head to the Borghese Gallery, filled with prized works by Bernini, Caravaggio, Rubens, and Raphael, while history buffs can explore the Catacombs of Rome or the ruins of Palatine Hill. Or, perhaps head to Via del Corso to do some last-minute shopping. Night: Rome is one of Europe’s great food cities, so spend your final night on a food tasting tour and explore the many restaurants, shops, and street food stalls around Campo de Fiori and the Trastevere district. In addition to sampling myriad pizza and pasta dishes, you’ll tuck into street food favorites like suppli (deep-fried rice and mozzarella balls), zucchini flowers, and sweet Maritozzi pastries. Visit the Sistine Chapel 90 minutes before it opens to the general public with this early-access ticket to the Vatican Museums complex. Explore at your own pace, stopping to admire Michelangelo’s famous ceiling fresco and his other works in a tranquil, crowd-free atmosphere. See the Vatican Crypts and St Peter's Basilica before your visit ends. Enjoy the Borghese Gallery and Villa Borghese Gardens in Rome with skip-the-line admission and a guided walking tour limited to 20 people. This popular attraction often sells out in advance, so by pre-booking your ticket, you can ensure you won’t miss the chance to see art by Caravaggio, Bernini, Titian, and other Italian masters, plus you’ll jump the queue. After exploring the gallery, stroll through the tranquil gardens (excluded on 7pm tour) with a view of the city from the Pincian terrace. Upgrade your ticket for a private tour exclusive to just your group. Taste your way through Rome's street food scene with this 3-hour food tour. Sample a variety of street foods, such as zucchini flowers, suppli, pastries, and pizza, while taking in the impressive scenery of historic Rome all around you. Check off the must-sees of Rome and Vatican City with this all-in-one pass that can be used over two day. Allowing you to visit the sights at your own pace, the prebooked sightseeing voucher includes skip-the-line access to the Colosseum, Palatine Hill, the Roman Forum, Vatican Museums, Sistine Chapel, St. Peter's Basilica, and the papal tombs. Just make one booking, and then use your pass to visit the landmarks at your leisure. An audio guide is also included. Explore the landmarks of Ancient Rome on a Segway tour with an experienced guide. On your own electric Segway, you’ll cruise by major Rome attractions like the Roman Forum, Colosseum and Circus Maximus. Learn about the Eternal City’s 2,000-year-old ruins while you zoom along the streets, and stop by the Mouth of Truth, Rome’s legendary ‘lie detector.’ Limited to just eight people, this tour provides a small-group experience. When in Rome, treat yourself to a luxurious Italian dinner at a family-run restaurant near the Pantheon. Hosted by a culinary connoisseur, this 2.5-hour experience includes three courses of local specialties, from pasta to a meat dish to dessert. Each course is accompanied by a glass of regional wine, and the evening starts with a classic Italian aperitivo in the private cellar, where you’ll enjoy a glass of prosecco served with cured meat and cheeses. This small-group dinner is limited to 10 people for a more intimate experience. See the Eternal City lit up at night on this evening tour of Rome with dinner. Begin at a restaurant near the Trevi Fountain for a traditional Italian meal, then take a walk around the area—part of Rome’s historical center—to enjoy the nighttime ambiance. Afterward, a panoramic coach tour takes you to see illuminated attractions, finishing at the Colosseum. Explore Rome at night on this walking tour that takes in the Eternal City’s famous attractions lit up in all their majestic glory. With a knowledgeable guide, walk past attractions such as the Pantheon, Trevi Fountain, and the Colosseum. Stroll through Piazza Navona, and pass by the ruins of the ancient city at the Roman Forum. This is a great way to get to know the city during the twinkling evening hours—the perfect pre-dinner experience.